Bundesliga | Is Anthony Modeste better than Aubameyang and Lewandowski? Is Anthony Modeste better than Aubameyang and Lewandowski? He's keeping pace with Pierre-Emerick Aubameyang and Robert Lewandowski at the top of the Bundesliga scoring charts, but could Cologne's Anthony Modeste actually be the best of the three this season? bundesliga.com takes a closer look. Could your Official Fantasy Bundesliga team do with some Modeste improvement? Click here! Bundesliga history was made this weekend. Never before had three players reached the 20-goal mark after 25 rounds of matches, but Anthony Modeste changed all that, as his superb hat-trick in Cologne's 4-2 win over Hertha moved him onto 22 goals for the campaign, one behind Pierre-Emerick Aubameyang and one ahead of Robert Lewandowski. As leaders of the formidable attacks of Borussia Dortmund and Bayern Munich, Aubameyang and Lewandowski were always expected to be battling it out for the 2016/17 Torjägerkanone – the iconic trophy given to the Bundesliga's top scorer at the end of every season. But few could have foreseen that Modeste – in spite of a very respectable 15 goals for Cologne last season – would be crashing their party so spectacularly this term. Comparing footballers is a dangerous business and the Frenchman still has a long way to go if he wishes to remain in his esteemed current company. Lewandowski, after all, is a four-time Bundesliga champion who already has a pair of Torjägerkanonen in his trophy cabinet, after notching 20 goals for Dortmund in 2013/14 and 30 for Bayern last season. In total, he has scored an eye-watering 142 goals in 219 Bundesliga appearances. Aubameyang's record is similarly vertiginous. With 77 goals in 119 Bundesliga outings – all for Dortmund – he has established himself as Lewandowski's chief rival, with both players averaging 0.65 goals per game in the German top flight. The Gabon captain is currently on course for his most prolific season yet for the Black-and-Yellows. Yet Modeste's achievements in front of goal this season – 24 goals in 28 games in all competitions – have arguably eclipsed those of 'Auba' and 'Lewy'. "What Anthony is doing at the moment is comfortably better than his rivals," insisted Cologne goalkeeper Timo Horn, after the Frenchman's hat-trick heroics against Hertha. "Lewandowski has six or seven chances served on a silver platter every match, but Tony has to make things happen. That's why he is higher in my estimation." Remarks to be taken with a pinch of salt, of course, but a spot of number-crunching shows that Modeste has indeed required fewer attempts on goal (78) than Aubameyang (84) and Lewandowski (100) to reach his current total of 22 Bundesliga goals. All three men clearly have a habit of "making things happen". Officially, Modeste has created a total of 99 chances, while it's 111 for Aubameyang and 127 for Lewandowski. But those figures – rather more difficult to quantify – don't quite tell the full story, because there is no denying that Dortmund and Bayern boast a far richer assembly of creative and attacking talent than Cologne. There are 13 players in Dortmund's squad with at least one Bundesliga goal this season, and 16 in Bayern's, compared to just seven for Cologne. So even if Aubameyang and Lewandowski shoulder the main goalscoring burden for their sides, they know their teammates are capable of picking up the slack, especially when they have an off-day. Modeste is much more likely to be left to his own devices. Indeed, the 28-year-old is the only player in the Bundesliga to have scored over half of his team's goals this season. In fact, with 22 out of 37, he has notched an incredible 60 per cent of Cologne's league goals. Aubameyang has grabbed around 43 per cent of Dortmund's, with 23 out of 54, while Lewandowski has just over a third of Bayern's – 21 from a league-leading total of 61 strikes. There is no doubt that Modeste is having a much greater individual impact on his team than either of his two rivals. Incredibly, Cologne have failed to win a single game this season in which the 28-year-old has not scored. He has found the back of the net in 15 outings, resulting in nine wins, four draws and just two defeats. The team's second highest goalscorer is Yuya Osako, with just six. 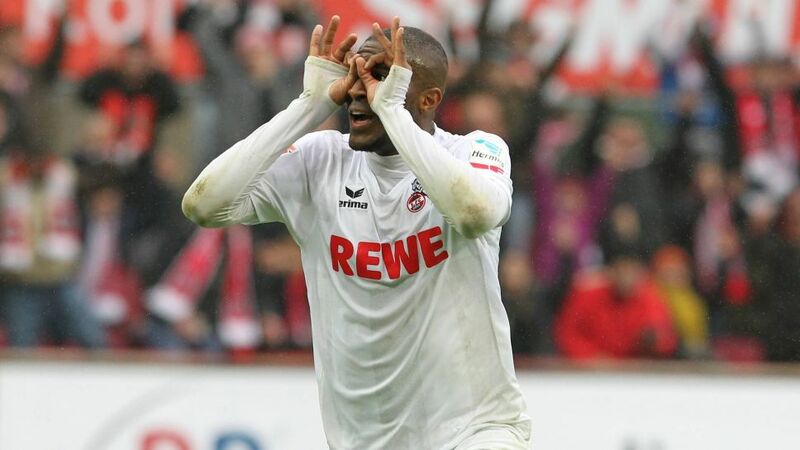 Modeste's magic has earned him a place in the Cologne history books. The last Billy Goats player to score as many goals in a season was Klaus Allofs in 1984/85, while Hennes Löhr was the last man to rack up at least 22 goals by Matchday 25. With nine games still to come, the Frenchman will have an eye on Dieter Müller's club record of 34 Bundesliga goals in 1976/77. Since being promoted back to the top flight in 2014, Cologne have finished 12th and ninth – but Modeste's efforts have pushed them up to sixth place this term, and sparked hopes of a first European campaign since the 1992/93 UEFA Cup. Saturday's hat-trick against Hertha also made him the highest-scoring Frenchman in a single Bundesliga season – leading many in Germany to question why he has once again been overlooked by France national coach Didier Deschamps, who didn't include Modeste in his squad for an upcoming 2018 FIFA World Cup qualifier against Luxembourg and a friendly with Spain. "When a striker is scoring like Tony – particularly in one of the strongest leagues in the world – then thoughts naturally turn to international football," Cologne CEO Jörg Schmadtke recently told Bild. "As far as we're concerned, his non-selection doesn't make any sense." Whether or not Modeste eventually earns himself a call up to Les Bleus, there is no doubt that he is currently in the form of his life – and Cologne are reaping the benefits. He may not enjoy the same international standing as his more illustrious rivals Aubameyang and Lewandowski – but the man from Cannes may well be the most important striker in the Bundesliga this season. Click here for the latest Cologne team news!